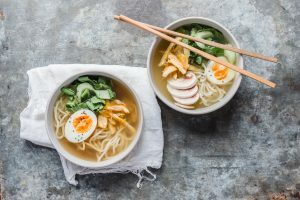 Ramen is one of the most restorative, nutritious and flavour-packed Asian dishes around. Super easy to make and just pure goodness in a bowl; the silky noodles and filling protein all balance perfectly in our bone broth leave you feeling nourished but not stuffed. Add a lovely soft boiled egg for added authenticity and slurp the end of the bowl if you want to. Our guest Blogger Dr Ciara Kelly of The Irish Balance shares her own version of this classic. Optional protein: I added half a block of sliced Smoked Tofu to this recipe and it was FANTASTIC – but if tofu isn’t your thing, you could add poach a breast of free-range Irish chicken! Hard boil the eggs in a small pot of boiling water (or whatever way you’re used to!) Prepare your veggies as listed in the ingredients list, and set aside in small bowls. When the eggs are done (I find a solid 7-10 minutes in water turned to simmer after it reaches boiling works for me!) drain the water, and set them into a bowl of cold water to cool. Heat the sesame oil in a small pot, and add the garlic, onions, ginger and chilli. Cook for 3-4 minutes until the onions are translucent. Add the soy sauce/tamari and the rest of the veg – cabbage, pak choi, pepper and mushrooms – and cook until softened. Add your bone broth or stock, then the water. Stir everything up, and bring the water to boil. When the water is bubbling, add your noodles, plus some extra water if needed. Turn the heat down to a simmer, add a twist of black pepper, stir again and cook for about 10-15 minutes or until the noodles are really softened. Peel the shells off the eggs, and slice each one lengthways. When your noodles are ready, pour into two bowls. Top with extra veggies to make it pretty, then add two egg slices to each bowl, and finally, add the chopped tofu or chicken pieces! Serve! Grab your spoon and tuck in!